In the (Semantic) Web, the existence or producibility of certain, consensually agreed or authoritative knowledge cannot be assumed, and criteria to judge the trustability and reputation of knowledge sources may not be given. These issues give rise to formalizations of web information which factor in heterogeneous and possibly inconsistent assertions and intentions, and make such heterogeneity explicit and manageable for reasoning mechanisms. Such approaches can provide valuable meta-knowledge in contemporary application fields, like open or distributed ontologies, social software, ranking and recommender systems, and domains with a high amount of controversies, such as politics and culture. As an approach to this, we introduce a lean formalism for the Semantic Web which allows for the explicit representation of controversial individual and group opinions and goals by means of so-called social contexts, and optionally for the probabilistic belief merging of uncertain or conflicting statements. Doing so, our approach generalizes concepts such as provenance annotation and voting in the context of ontologies and other kinds of Semantic Web knowledge. 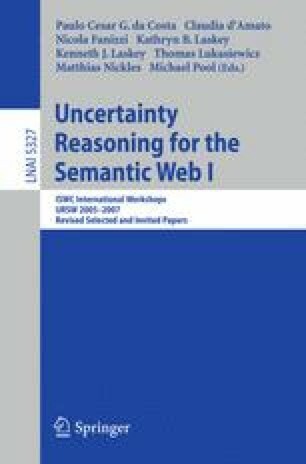 This work is a revised and extended version of a paper published in the Proceedings of the Second Workshop on Uncertainty Reasoning for the Semantic Web (URSW-06), 2006.